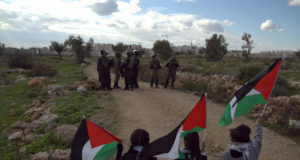 On July 7th, at 13:00 the people of Bil’in, joined by a Basque Nationalist musical group and International and Israeli activists, started their weekly rally to protest the ongoing construction of the illegal Apartheid wall on their lands. 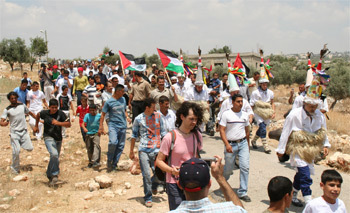 One hundred people started the march, which was launched in front of the mosque and ended at the gate in the wall. The Basque musical group, in traditional ceremonial attire and formation, kept the beat for the demonstration by marching with large bells that they wore on their lower backs, led by an individual in front who blew on a traditional horn. They were chased away by rubber bullets and sound bombs from the soldiers but returned to perform their art and pass through the line of soldiers that were holding people back. They stated their intent of solidarity with the Palestinians: “we too have been fighting an occupation of our lands for generations”, and wished to express their support for the Palestinian resistance. The Israeli military became violent as soldiers tried to arrest non-violent protester, Iyad Buranat, a member of the Bil’in committee against the wall and settlements . 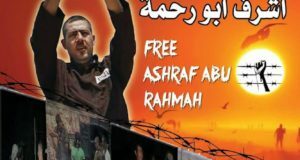 Other Palestinians and came to his aid to try to prevent his arrest and were caught between the Jeeps and the barbed wire as soldiers beat them. 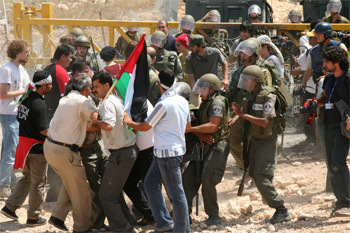 They grabbed the hands of the soldiers to stop the beating and were successful in deescalating the situation so they could talk with the soldiers. 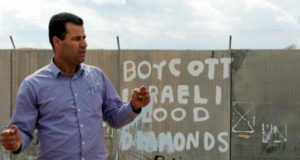 Iyad Buranat was again targeted for arrest and pulled inside the gate, separated by the group by rolls of barbed wire. Several people ran to his aid, despite being blocked by soldiers, and a small group was able to successfully prevent his arrest. The demonstration ended with five people injured. Ahmed Mohammed Hamad, 55, of Bil’in suffered damage to his right ear from a sound bomb. Mohammed Katib, 33,A member of the Bil’in committee against the wall and settlements, suffered bruises and tears to the skin in his left torso from soldiers roughing him up. Michael, 23, from the US, suffered tears in the skin of his forearms from schrapnel from a sound bomb. His right forearm was damaged when he was thrown by one soldier against another’s shield with extreme force. Ashraf , 22, of Tulkarem, suffered a rubber bullet to his upper left thigh as he was walking by the soldiers. Khaled, 18, of Bil’in, was hit with a rubber bullet in the leg. 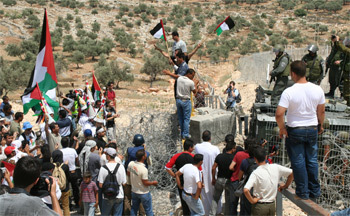 This evening the army revoked the order declaring the area a closed military zone. A team of three internationals gained access through the gate which had been denied to them after the demonstration. They have now relieved the lone Palestinian who was manning the outpost, and the area has been declared open for the time being.